I need to admit something. I’m a sucker for decorative soaps. Really, I love any soap that makes my bathroom look classier or has special ingredients to help my skin. When I can get both, then I’m really happy. I always have special soaps in my bathrooms – you know, those fancy little soaps that you put out to impress your guests? I use those all the time. They’re just so elegant and I love the way they smell. 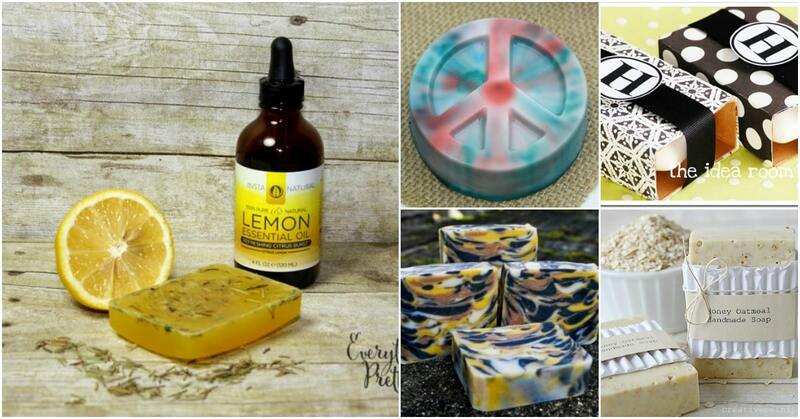 You can imagine how excited I was when I found these 35 decorative soaps that you can actually make yourself! Not only are these decorative, they’re homemade, so you know exactly what’s going into them. That means no worries of allergies or breakouts. You control what you’re putting on your skin and many of these little soaps have ingredients that will help you to control any number of skin issues from acne and breakouts to wrinkles and fine lines. 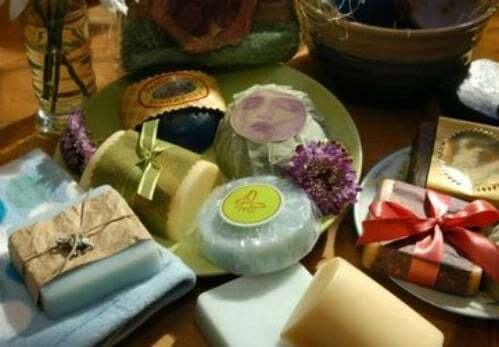 Imagine a decorative soap that will beautify your bathroom and one that helps to beautify your skin. And, if you’re into relaxing spa-like experiences, be sure to check out these 30 easy homemade bath bombs. They’re…..the bomb! So for the soaps, these are all made with easy to find ingredients and you can mold them into whatever shapes you want. Some of these simply give you the recipe to make the soap, so the mold is all up to you. 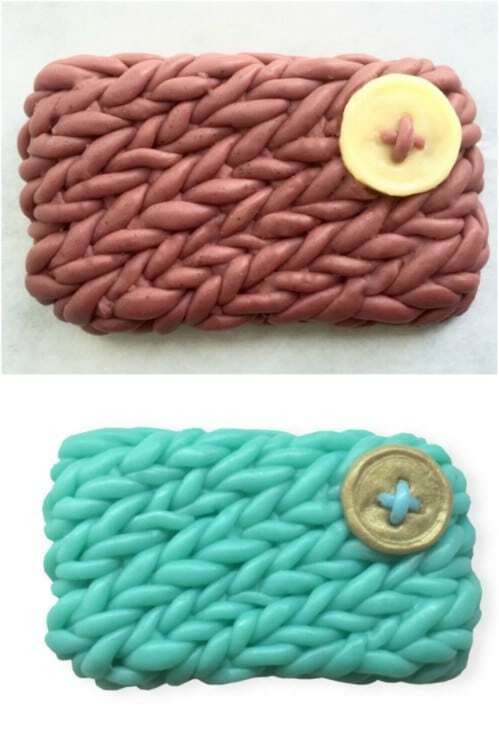 You can find candy molds at any hobby store for pretty cheap and those work beautifully. Some also give you color and decorating instructions to create the most beautiful little soaps you’ve ever seen. And, speaking of beautifying your bathroom, you have checked out these 20 DIY bathroom vanities? They will really help you to improve the look of your bathroom. 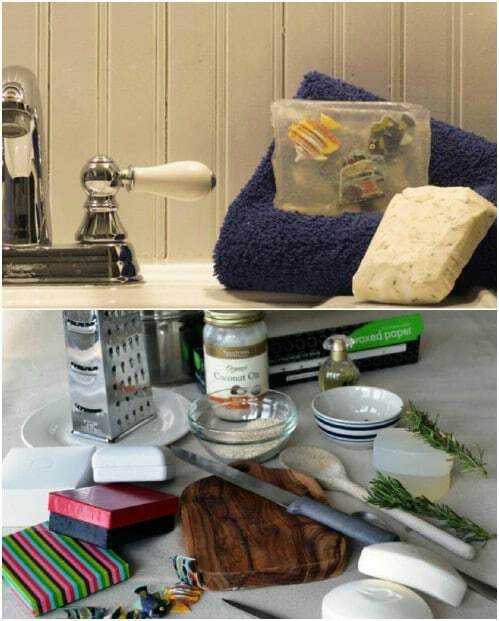 Whether you just want a great homemade soap that will help you to battle those skin conditions or you want something to dress up the guest bathroom, these homemade soaps are perfect. There’s everything from cinnamon coffee soap to confetti hearts and even a great avocado oil soap that is really good for your skin. Take a look and as always, let me know which of these little soaps is your favorite. These little charcoal soaps are a dark color, which would be great for adding a contrasting color to your bathroom. 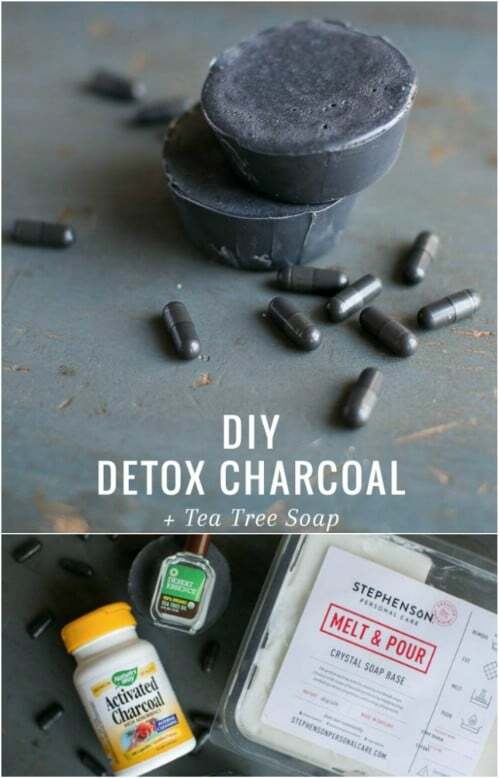 You can mold them in soap or candy molds to make them really cute and they contain activated charcoal and green tea, two ingredients that are perfect for helping to clear up troubled skin. If you don’t like the smell of green tea oil, you can actually substitute peppermint oil and get the same effects. 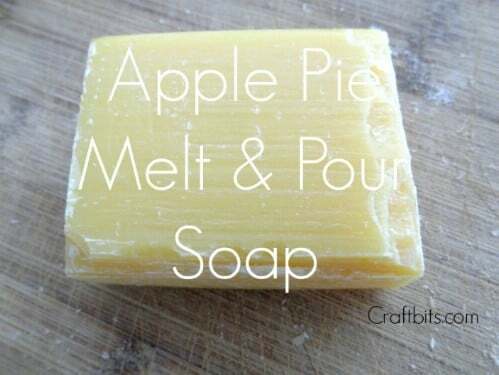 These little apple tart soaps smell just like Mom’s apple pie and the soap is really easy to make. With apple pie fragrance and cinnamon, they’re perfect for the holidays or you could use them anytime you want to give your bathroom a nice, homey scent. You can mold them in cute little tart cups to make them look just like little apple tarts and even color them red and green if you really want to dress them up a bit. Not only is this avocado oil soap pretty to look at, it contains olive oil, coconut oil and other ingredients that are really great for the skin. Lemongrass and sweet orange give it a wonderful scent and although there are a few steps required to get this gorgeous marbled look, it’s definitely worth the effort. You’ll have a soap that is not only gorgeous, it’s healthy to use. 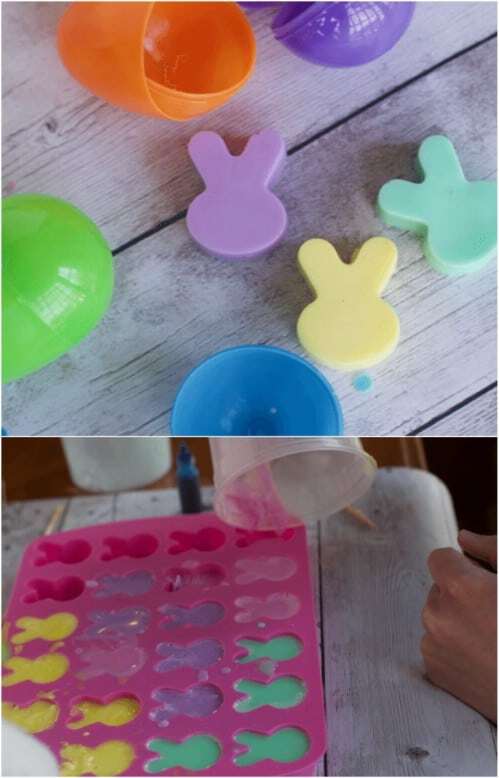 Whether you want something special for Easter, or you’re just looking for a cute little soap to decorate the kids’ bathroom, these little bunny soaps are going to steal your heart. They’re easy to make and perfect for adding to Easter baskets or making as springtime birthday gifts. Make them in any number of different colors – they’re also safe for all skin types! Sunflowers are great for adding warmth and cheer to any room…even the bathroom. That’s why I love these little sunflower soaps that are made from goat’s milk. They’re really colorful, too and will instantly give your bathroom a lift. You can order these from Etsy. They come in many different fragrances and color choices for $5 for each bar. 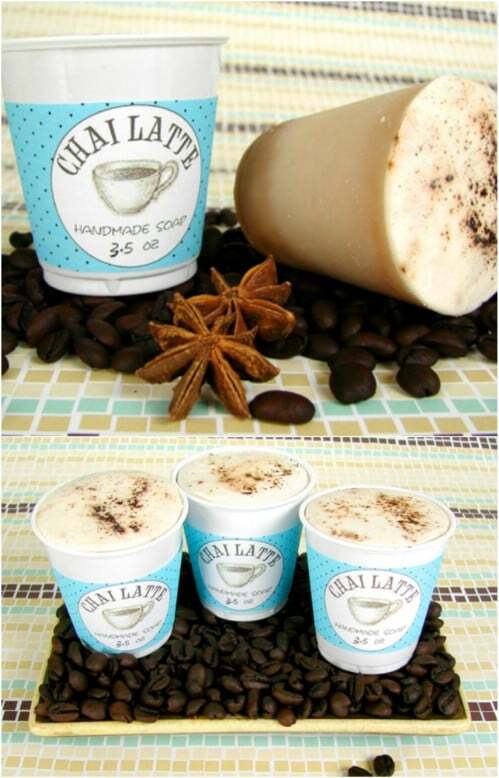 These chai latte soaps actually look like something that you would pick up from Starbucks. They smell wonderful and look so realistic! Plus, they contain olive, palm and coconut oils as well as cocoa butter so they’re really good for your skin. They’re almost too pretty to use, although you should definitely use them given the wonderful ingredients that are included. 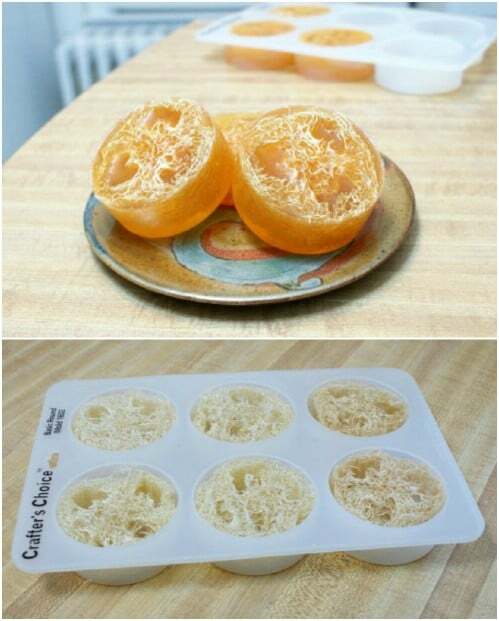 And, you mold them in paper cups so there’s no need to buy a soap or candy mold for this one. 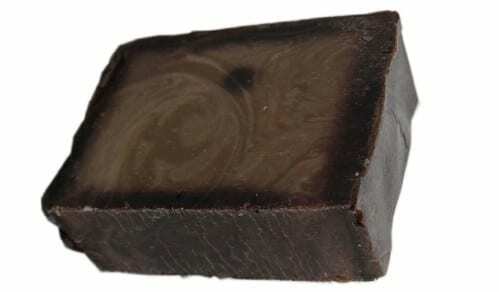 Chocolate soap! Yes, it is a real thing and it’s an easy soap to make. Now, you could mold this in a soap mold, or just make it into a bar which seems more appropriate for chocolate don’t you think? I would also add some sprinkles or something to make it really pretty, but that’s just me. This goat’s milk, cocoa butter, shea butter and so many other wonderful ingredients that make it smell wonderful and provide great health benefits to your skin. Coffee is definitely my favorite thing in the morning – in a cup, of course. But, this coffee and cream soap would absolutely become my favorite hygiene regimen. It’s gorgeous to look at and smells wonderful. With freshly ground coffee, powdered milk and vanilla, you are sure to love waking up to this soap every morning and it’s pretty enough to decorate your bathroom for special guests. Not only does this cinnamon coffee soap smell nice, it’s also a great exfoliator. 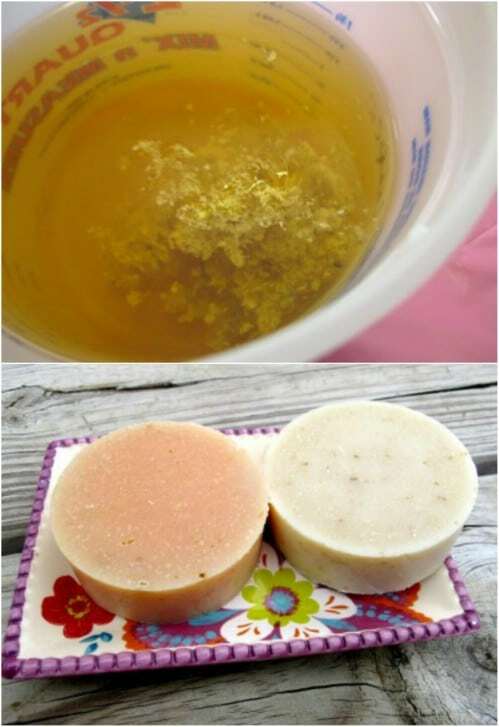 If you need something to slough away those dry skin cells, this is the perfect homemade soap for you. Plus, it’s a really pretty soap, especially if you pour it into molds. Or, you could make up a large batch and slice it like coffee cake or sweet bread. The color is gorgeous and you’re sure to adore the scent. These little bars of soap have blocks of color that are perfect for matching any bathroom décor. Not only are these great for your skin, they’re perfect for adding that decorative touch in the guest bathroom or your own personal bathroom. You make them in a soap mold – or you could find any number of things to mold them into – and you choose whatever colors you need to match your bathroom décor. I love these little confetti soaps! You can actually do these in whatever shape you want, but the hearts are really adorable. You make them with glycerin bars, that you can pick up at any craft or hobby store, as well as confetti. Mold them in your soap molds and choose whatever shape or confetti you want. You could also add coloring if you want to really make them decorative. What’s more cozy than your favorite sweater? This soap that you can decorate your bathroom sink with! It looks like a comfy sweater, right down to the little “button” at the top. These are so adorable and come in a wide variety of colors and scents. This one can be purchased on Etsy for under $20, which is a steal considering that it is a homemade soap and did I mention that it looks like a sweater? What makes this cucumber soap decorative is the color. The green is gorgeous or you could do it with a little less green but have specks throughout. 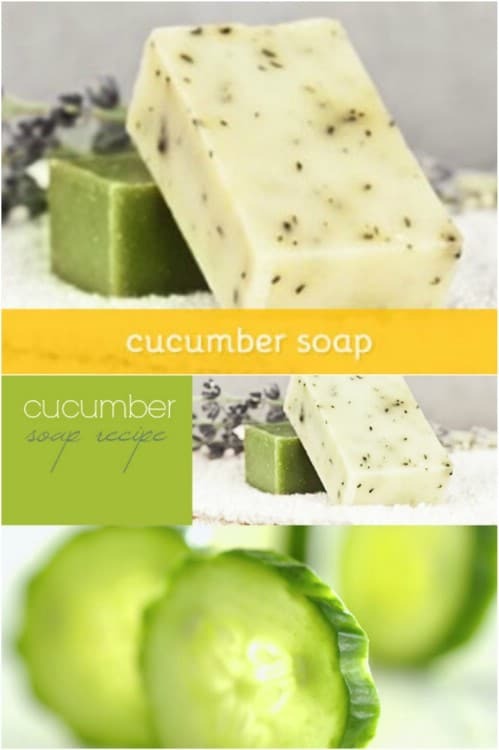 It has a really great rustic country look to it and of course, it has cucumber pulp which is excellent for the skin. 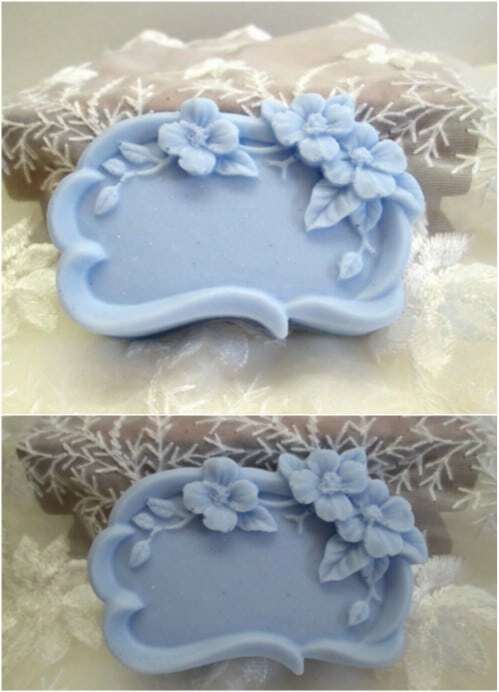 You could also do these in molds if you prefer that to bar soap, but personally I think the bars are really gorgeous. 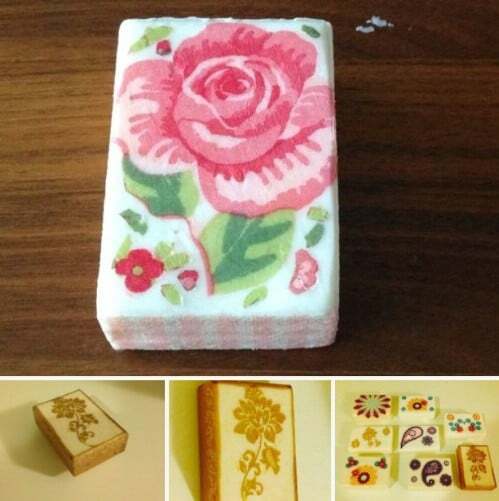 Turn your guest bathroom into a beautiful display with these decoupage soaps. 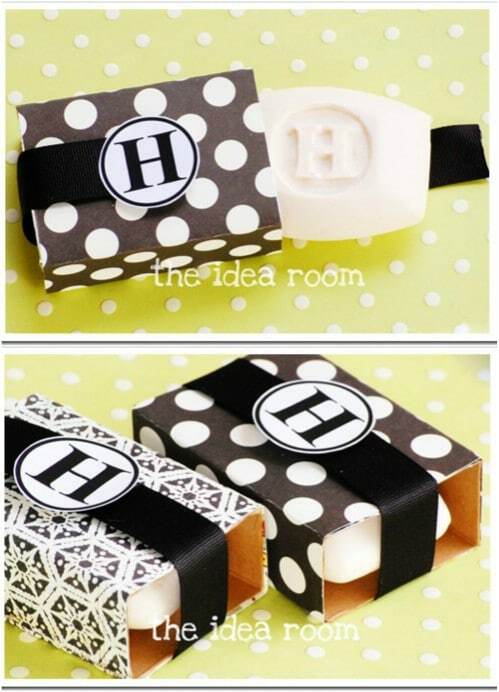 This is the perfect way to get seasonal soaps because you can add whatever picture or design you want. 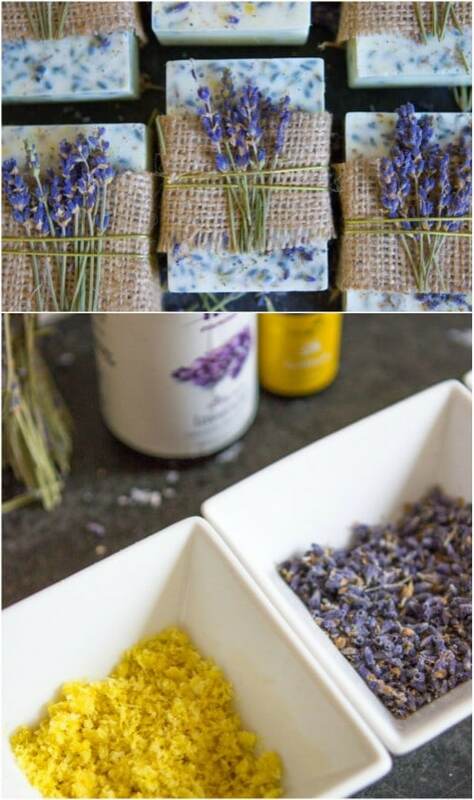 You make these with regular bar soaps and then add the pictures that you want. These are more for decoration than they are for actual use, although you can use them if you want. Fresh ginger is really good for you. It has natural pain fighting properties that work whether you ingest it or come in contact through the skin. That’s what makes this fresh ginger soap so great…well, that and it’s easy to make. It also makes a wonderful decorative soap because it has little flecks of ginger throughout. 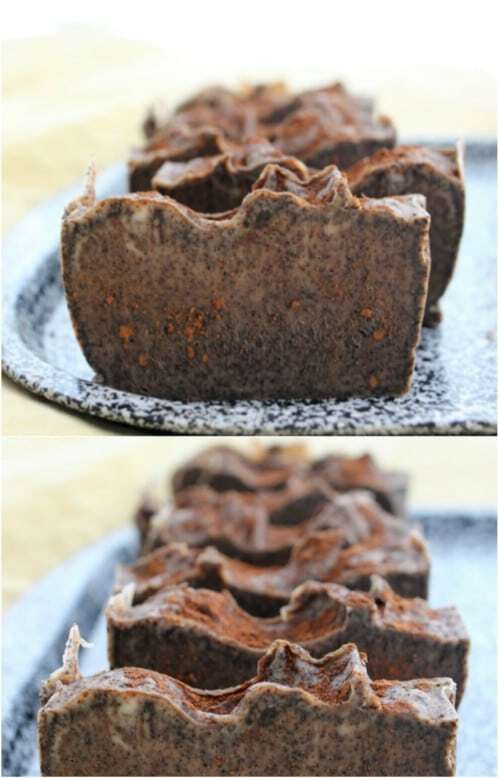 Mold it in a soap mold or cupcake liners, it’s pretty either way and smells amazing. I have to say, these gemstone soaps may just be my favorite homemade soaps. They’re just so gorgeous and perfect for dressing up your bathrooms. From the shapes right down to their swirls of color, these are just the most beautiful soaps I’ve ever seen and they’re not at all difficult to make. You can add any scent that you want with essential oils and they will smell as pretty as they look. Eucalyptus is one of my favorite scents. It just smells so fresh and wonderful and when you combine it with grapefruit, it’s even better. 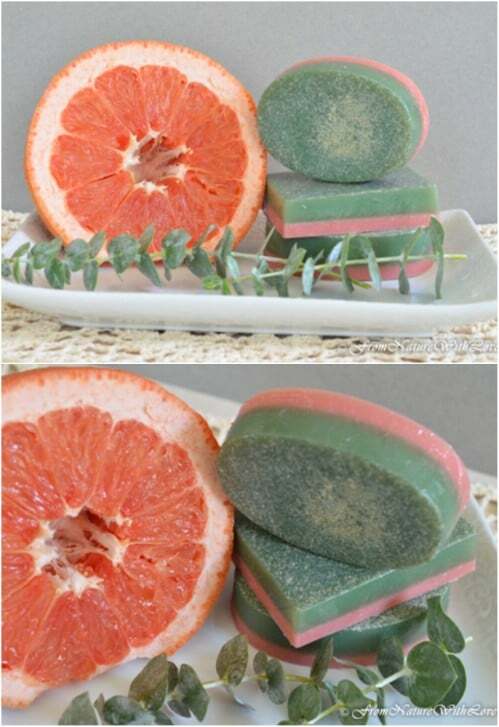 That combination can be turned into pretty little decorative soaps, too that have a nice grapefruit pink on one side and green for the eucalyptus on the other. 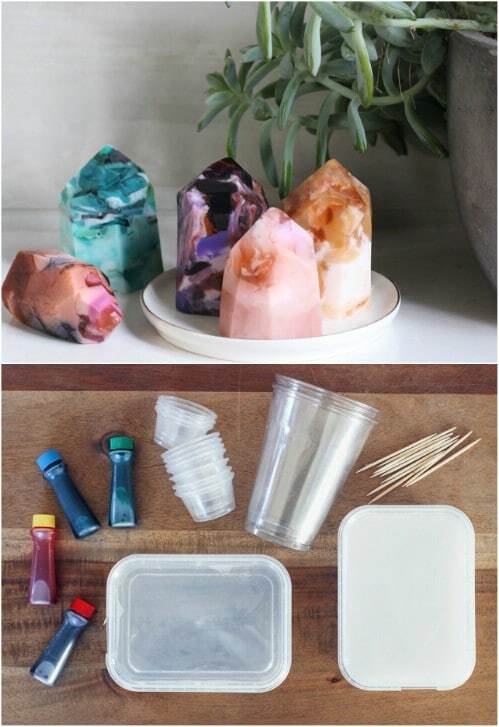 These are pretty easy to make and you can mold them in a shape or use a bar mold to just make square soaps. 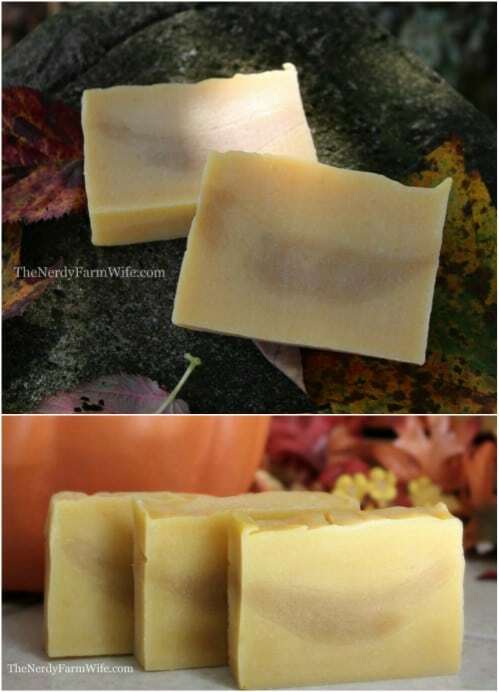 Here’s a wonderful little decorative soap that you can make from your favorite store bought soap. 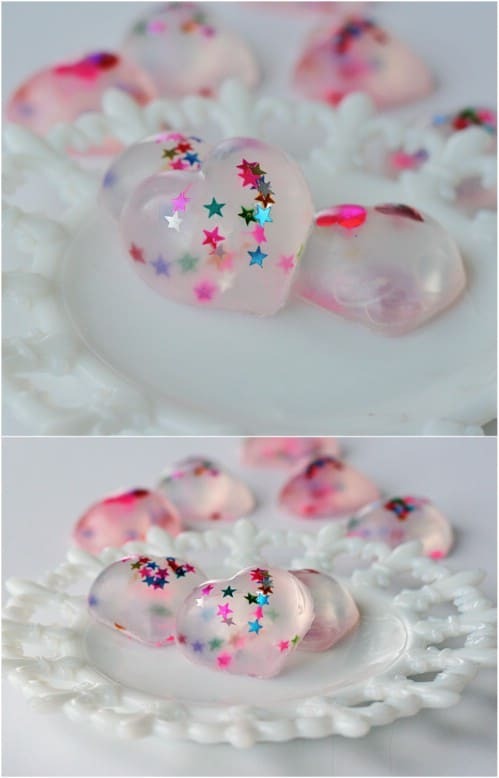 To make these little hearts, you just grate a bar of soap, add water and then mold. 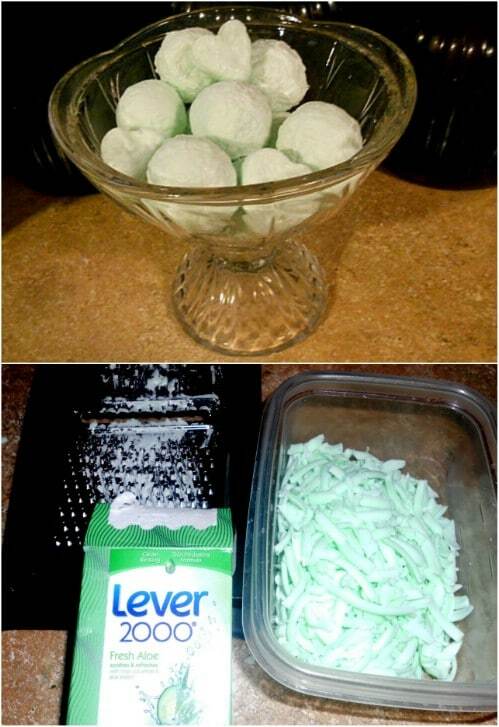 If you’re looking for the fastest and easiest way to get decorative soaps in the bathroom, this is it. You can also use any soap that you want and if you want to color the hearts – or whatever shape you choose to do – just add a touch of coloring before molding. I realize the holidays are quite some time away, but that just gives you more time to make up several batches of these gorgeous little soaps. These would make wonderful gifts – just tie them up in cellophane and add a nice little bow. 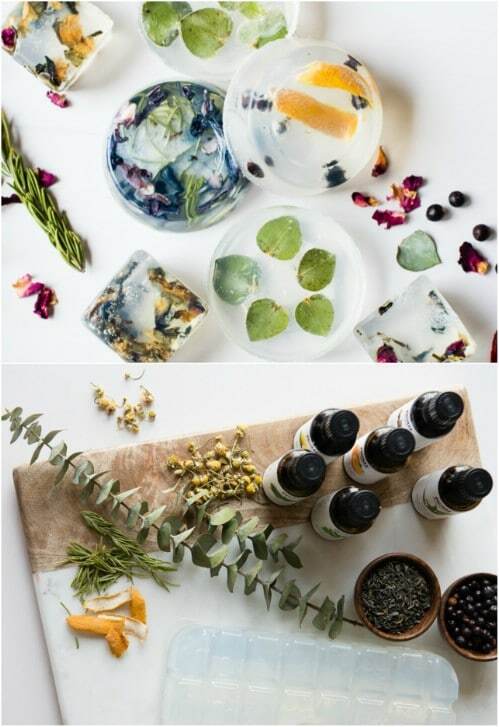 Dried flowers, spices, herbs and leaves can be seen right through the glycerin soap, making them absolutely beautiful to display. And, they’re perfectly safe for use as well and smell amazing when they’re finished. These little soaps have lavender, oatmeal and goat’s milk, all of which are great for your skin. They’re also very decorative with oats sprinkled throughout and they smell amazing. I love lavender soap and this one may just be my favorite. 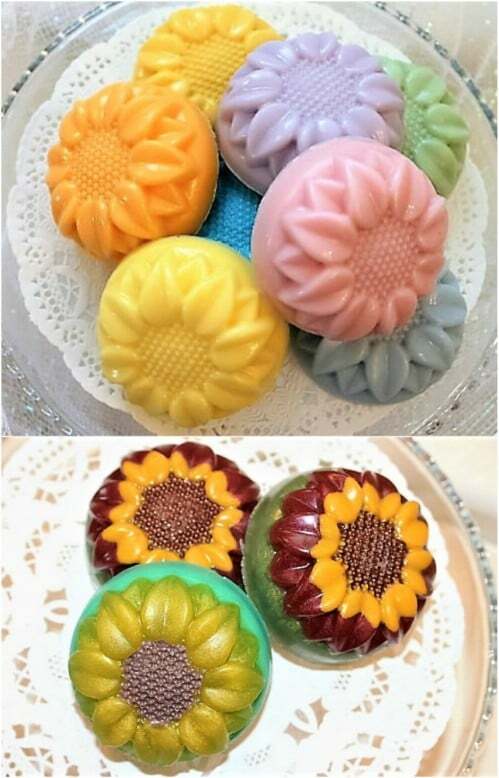 You can mold these really easily or use a cupcake tin to make small round soaps that are perfect for giving as gifts or decorating your bathroom vanity. This is an easy melt and pour soup recipe that is so gorgeous when it’s finished. The lavender specks give it a beautiful color and it contains ingredients that are so healthy for your skin. You could easily mold these into shapes but I think the bar shape is really pretty, especially when you wrap a piece of burlap around it and add some dried lavender. 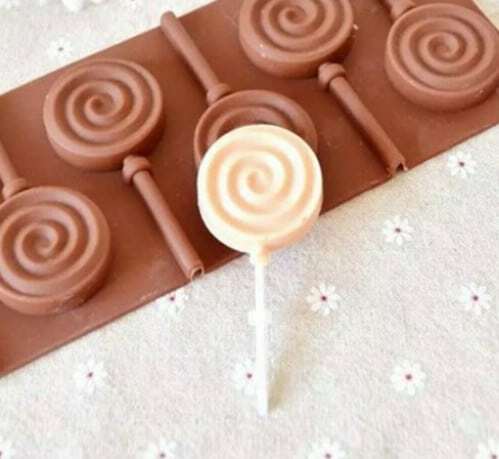 You can use a white soap base or clear glycerin soap to make these adorable little lollipop soaps. Talk about a way to get your kids to wash up for dinner! 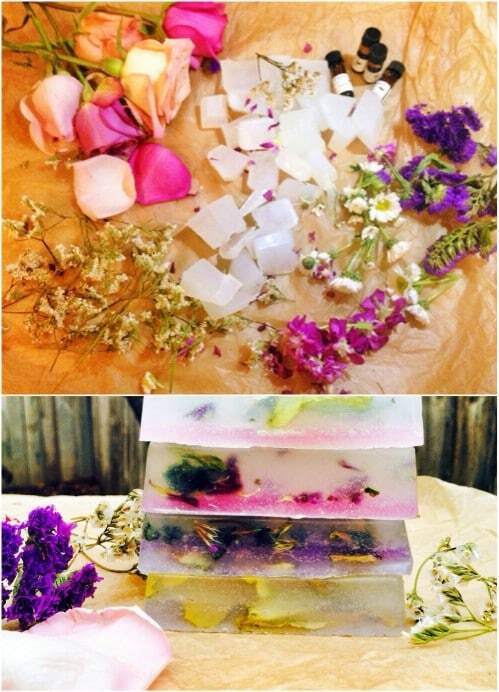 They will love these soaps and you can make them multiple colors if you want or add any number of things to make them even more fun than they already are, like dried flowers, confetti, or all sorts of other decorations. These hand carved soaps with monogram are really easy to make and they’re so gorgeous when they’re finished. These would also be wonderful as gifts or you can use them to dress up your own bathroom and make it really fancy for guests. 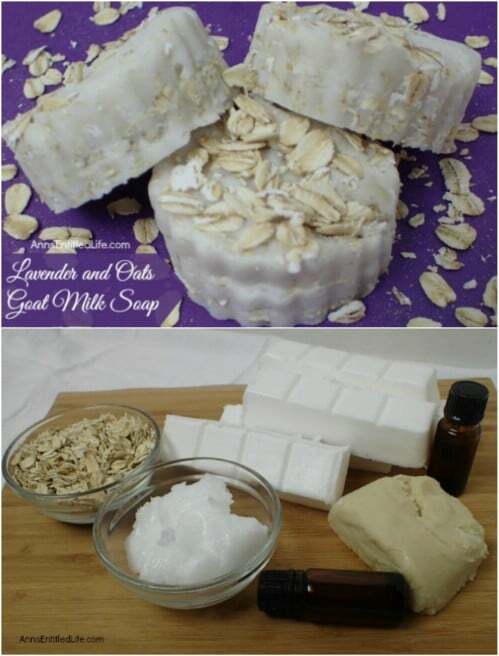 You use store bought soap for this one, unless you want to make your own soap bars. Then just make your monogram basically using a self-made stencil. 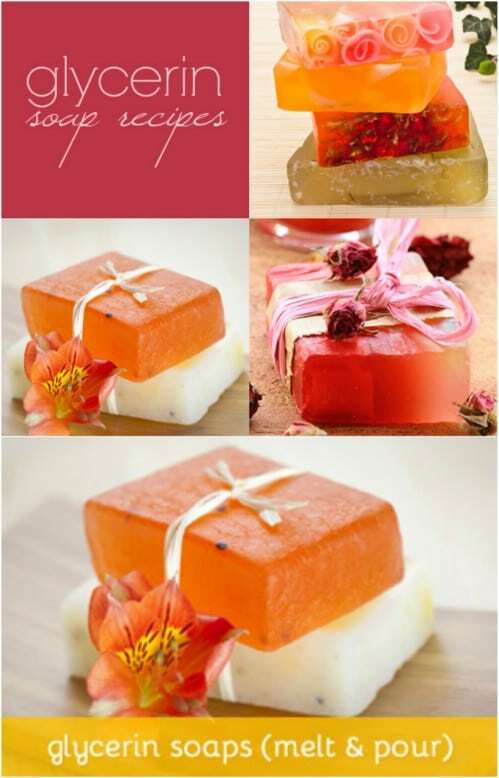 Here’s a wonderful soap that is easy to make and looks beautiful when finished. This one is really simple and has a wonderful rustic charm to it when it’s done. 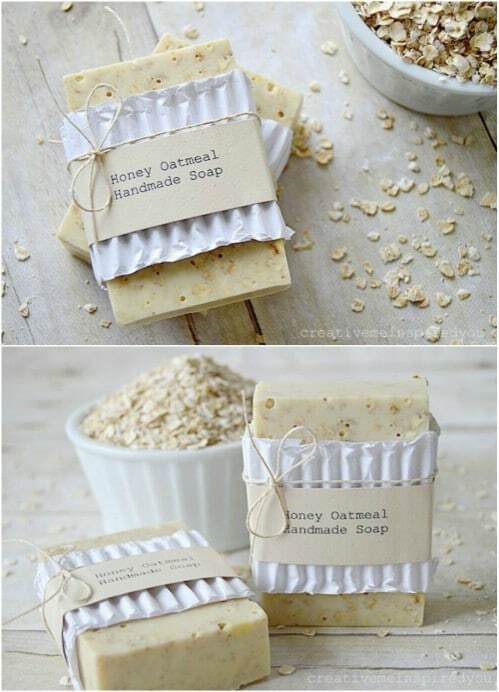 You use a goat’s milk soap base and add honey and oatmeal which are wonderful for the skin. You can also add coloring to these with food coloring if you want or leave them their natural color which is really pretty. 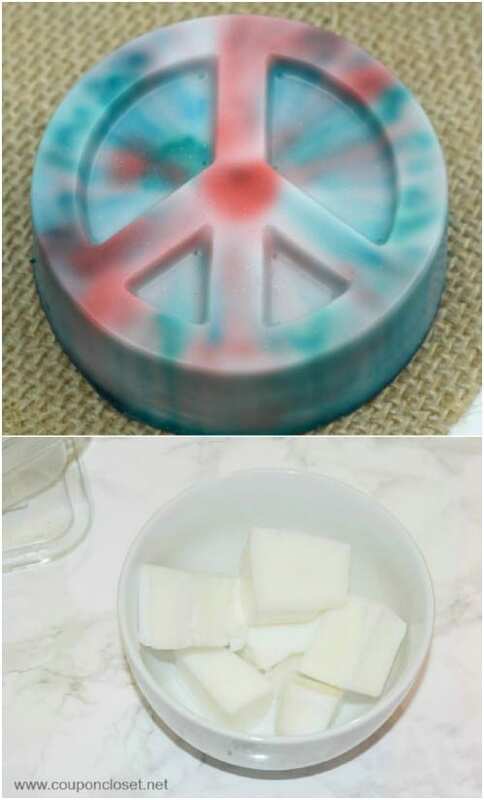 Mold them in soap molds to make shapes or just make bars and decorate. These buttermilk soaps – which are great for the skin, by the way – are shaped into beautiful floral frames and they’re perfect for fancying up your bathroom. These are on Etsy for $7 for two bars and you can choose your color and your scent. If you want something really elegant for the bathroom, these are perfect plus you have enough color options to match your existing bathroom décor. 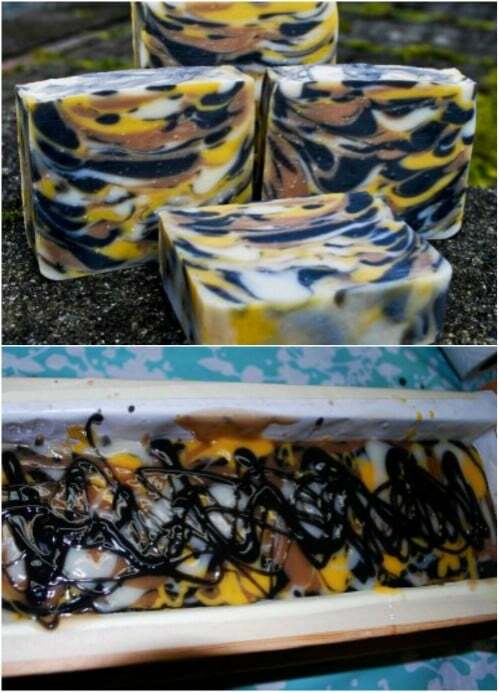 I just love soaps that have swirls of color and this pumpkin vanilla soap is absolutely beautiful. Not only does the vanilla swirl make it look great, it gives the soap a yummy scent. You’ll think you’re baking pumpkin pies! This one is a cold process which is a bit different than melt and pour, so it may take a bit more time. When they’re finished, these bars are gorgeous and make wonderful gifts around the holidays. I love these little soaps that have rose petals in them. You can see the rose petals through the soap base and when you also add rose essential oils, you get a lovely scented soap that looks as good as it smells. These are pretty easy to make, too. Just add dried rose petals – or whatever flower you want – to the soap base when you mold it and they will come out beautiful every time. 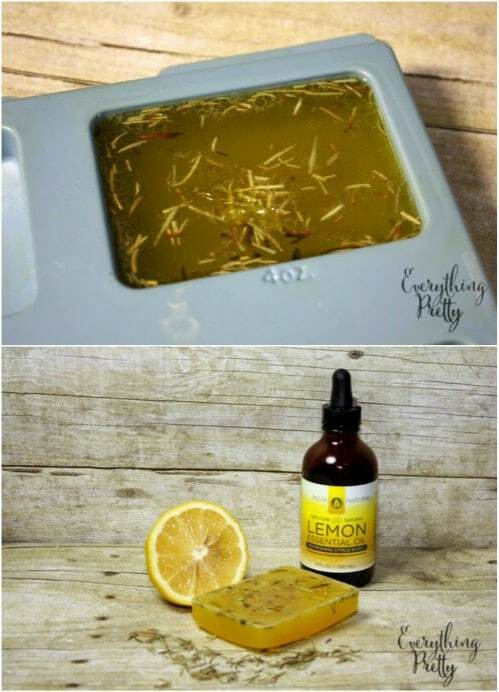 This rosemary and lemon soap is perfect for the kitchen or you could use it to decorate the bathroom vanity as well. The dried rosemary makes it very decorative and it has a wonderful lemony scent. 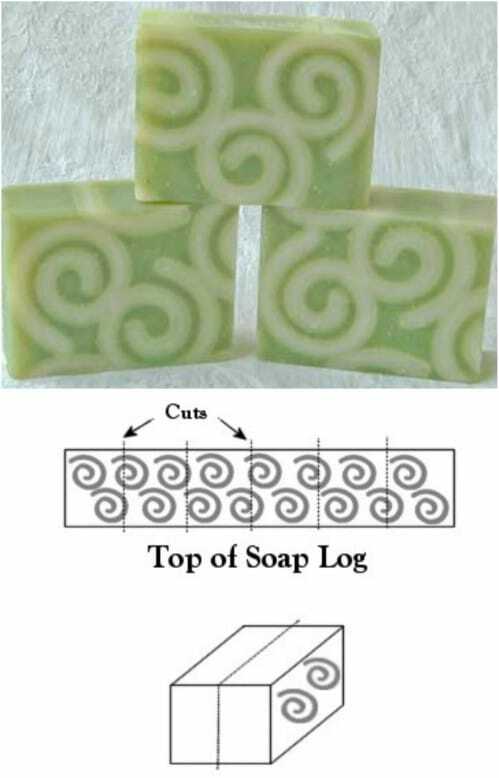 It’s an easy to make soap that can be turned into bars or molded in your favorite shape by pouring it into a soap mold. These little soaps are very decorative when you mold them and they contain dried lavender and chamomile as well. They’re made with herbal tea bags, which are very beneficial to the skin. They’re really easy to make and so decorative with their dried flowers and herbs. You can tie them up in cellophane to give as gifts or use them to decorate your own bathroom. These spoon swirl soaps are absolutely stunning with loads of color. They have coconut, olive and palm oils, all of which are great for your skin and they’re just filled with color. To make the swirl design, you just spoon the colored soap liquid into your mold, swirling as you add additional colors. These are so great and so very easy to make. 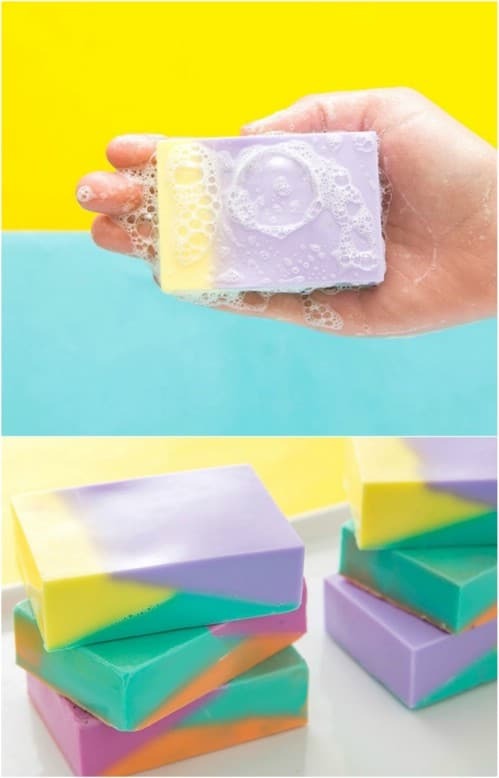 I love these little tie dye soaps! They’re so cool and colorful and a great way to dress up a teen’s bathroom. You can mold them into bars or peace signs or whatever you want. They’re a melt and pour soap, so they’re really easy to make and you can add whatever essential oils you want to give you the perfect scent. These are quite possibly the grooviest decorative soaps I’ve ever seen. I love the idea of using scrapbook paper to create decorative soaps. This really gives you so many options for your bathroom decorating, and these can be made with really cheap items that you can pick up at the Dollar Store. You can do these with scrapbook paper or fabric and the turn out beautifully. Mod Podge keeps the decoration in place but only on one side, so the soap is still completely useable. 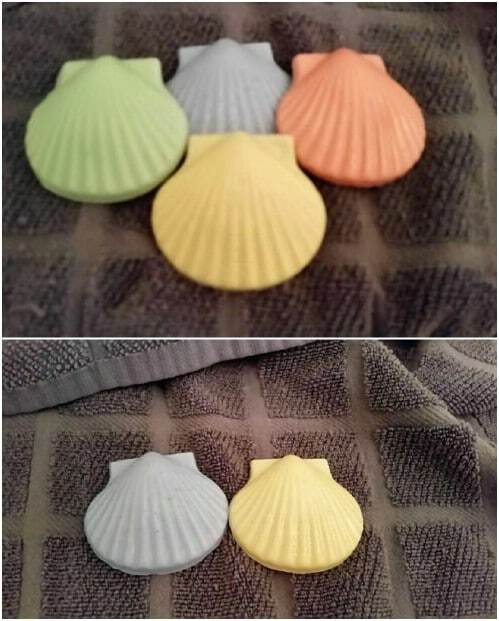 If you’re looking to incorporate a beach theme into the bathroom, these little seashell soaps are perfect. You could make these yourself with a seashell mold or check out these that I found on Etsy. You get five soaps for $5 and you can choose your color or combine colors and choose your scents. inside it, which makes it really unique. These are perfect for guest bathrooms or for gifts for upcoming birthdays or holidays. You don’t have to buy a soap mold if you don’t have one on hand. You can use a cardboard box that your jewelry comes in to mold soap into bars and create beautiful looking decorative soaps. 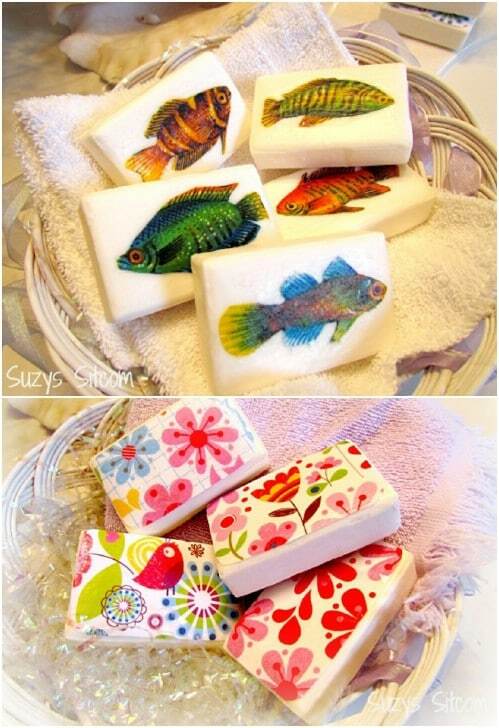 I love the glycerin soap with the fish embedded, which is really easy to do. You could put in just about anything that would match your bathroom decor and kids are going to love using soaps that have little creatures in them.